Metro Bike-Share Transit Integration and Pricing: What Do You Think? There is a great new report out that shows that bike-share systems really are legitimate, full-fledged transportation facilities. The focus of the report is how bike-share interacts with other transit systems. The report is summarized in this excellent CityLab article. Researchers surveyed bike-share users in both Washington DC and Minneapolis. Bike-share users living in central city areas used transit less, because bike-share trips replace short transit trip in denser core areas. Bike-share users further from the core reported an increase in transit usage, reflecting bike-share’s role in solving the first last mile connection to transit. I am getting a reputation as a bike-share contrarian these days, but I am not so invested in “tight integration” between bike-share and transit being a top priority. If it is a choice between, say, decent integration vs. bikes on the ground two months sooner, I would have to go with getting bikes on the ground. It’s not entirely clear to me how tight integration of transit and bike-share should work. 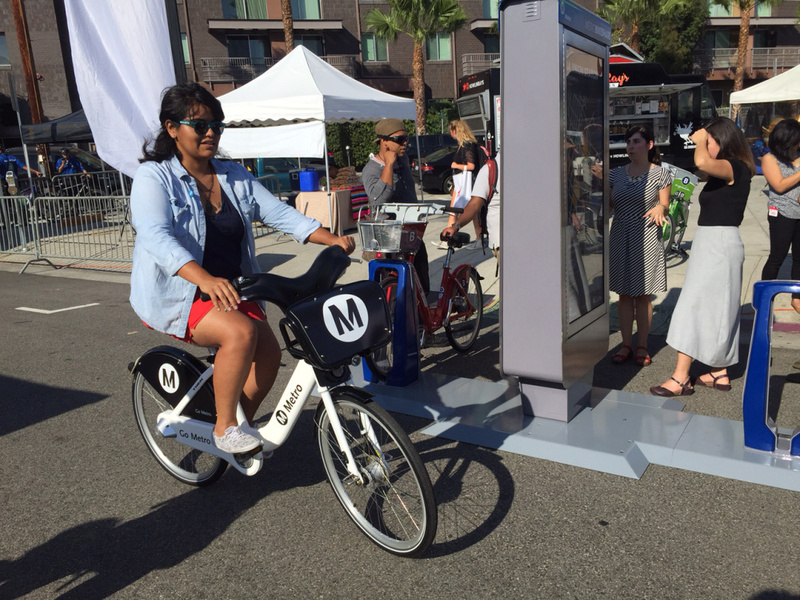 Locate bike-share kiosks at Metro stations? Of course. Integrate TAP fare card with checking out a bike? Maybe. I do not see TAP integration as a straightforward easy task. TAP cards expire after a couple years. Anyone can buy a TAP card for a few dollars cash, and then can immediately ride a bus or train… but no bike-share system can allow a user to check out a $1000 bike without a credit card or other guarantee in place in case the bike is lost or stolen. So, there is likely another step that ties a TAP card to a credit card: either adding a step to TAP machine purchasing, or perhaps requiring the user to use a smart phone to link a TAP card with a credit card. Anything that makes purchasing a TAP card take one screen longer should be a non-starter for anyone who has missed a train while waiting in line to buy a card at a Metro station TAP machine. I do not mean to say that no fare-payment integration should ever occur. Only that, in my opinion, it is something that might be addressed in future phases. Maybe integration can be prioritized when some TAP cards go away and riders can just tap their phones for fare. I am curious to hear how and when SBLA readers think that Metro should integrate bike-share and transit. The other bike-share issue being batted around on the interwebs is bike-share pricing structures. Santa Monica approved bike-share pricing that does not include an unlimited annual pass. San Diego’s new bike-share system has been criticized for being too targeted toward beach tourists. The only pricing I’ve personally used was a NYC unlimited annual pass, which I think really encouraged a lot of short spontaneous trips, but the NYC system has also experienced cash-flow issues and raised its prices, throwing into question its funding model. I think that some of the pricing boils down to the goals of the program. All transportation modes are “subsidized,” from the 405 freeway, to transit, to bike-share. Are the benefits of bike-share big enough for the public to pay for its operations similar to other modes? Does unlimited use pricing mean more bikes on the streets, more safety in numbers? Should Metro see bike-share as a loss leader that gets people on transit – like, say, a half-billion dollars worth of free parking? But that’s another story. Again, readers, what do you think? Anyone aware of other bike-share pricing models that are working well? From the Atlantic article, it really does sound like bike share may work very well in LA as a last mile solution. I assume we will see usage patterns more like Minneapolis than like DC. TAP integration does sound tough though. It would be great if the bike share kiosks had a tap reader and could detect if you still had time left on your current Metro fare. The bike could be treated as just another transfer that is free as long as you’re within the time limit. But I don’t see how to avoid having a separate ID card or ID process for the bike share system. Maybe they could eventually design a dual card that would work on both systems. But I assume that would be fairly complex and I agree that it would be a mistake to delay bike share further just for that. I wonder if doing away with “unlimited use” memberships might decrease bike share siphoning off some of transit’s short haul riders. I assume some of the shift comes from people who see a free bike ride versus a paid bus ride. But overall, I’m still hopeful that anything that increases non-auto mobility will be good in the long run, even if it takes some fares away from transit in the short term. I don’t see how it would increase lines at ticket vending machines. You would pre-register the TAP card online prior to using bike share. This is what is done in many bike share systems in Asia. If you just have an unregistered fare card, you can’t unlock a bike. Using the Metro pass model may be difficult and confusing – I think the transfer model, where bikeshare is considered a “municipal operator”, is probably better. It basically functions as a discount from the rate if you use transit on either end. So, the bike share would essentially give a discount to the ride cost. You could have joint Metro/bike share passes – a $10 price point per day would be appropriate. An interesting issue might come up in terms of Federal tax law, though, since transit benefit cards cannot be used for non transit activity and TAP cash would now be able to used for non-transit purchases. Many people use transit debit cards like Wageworks to save on taxes, and these cards are also valid on Amtrak. Clipper has the convoluted “parking” and “transit” balances for this reason, meaning that you can’t use transit dollars to pay for BART parking. What do I think? I think the articles that you linked are very encouraging! This could be a game changer if Metro can truly integrate bike share into the transit path as a first-mile/last-mile solution. Personally, this would work great for me on my Expo ride into downtown. I wouldn’t even mind if Metro charged an extra fee (say 50 cents) for the bike portion of the trip. The LA Times article also mentioned that Metro and the member cities (LA and Pasadena) plan to subsidize a significant portion of the system (52%), so that users only have to bear less than half the cost. It seems that a lot of the systems that have failed did so because they tried to implement a pricing structure to be self-sufficient, which probably isn’t realistic for most start-ups. My biggest concern is that the current plans for the bike share system in downtown LA is spread too thinly. They have over 1,000 bikes, but they only plan to use 65 stations, in an area of approximately 7 square miles. This means that the average spacing will be approximately one-third of a mile, or a ten minute walk. That can be lead to big problems if you go to a station and either can’t find a bike available or if you get “dock-blocked” and can’t return your bike. Why can’t they double the number of stations so that the average spacing is a five minute walk, and so you can find a back-up station nearby? On the annual pass question, I really do think that the membership model helps to encourage longer-term use than pay-per-ride-only options, and is particularly useful for retention for resident users of choice on a new transportation option. Those same excuses to not participate exist for bike share. Introducing sunk cost and removing considerations of lack of value for short uses will help benefit use of Metro’s bike share. I am worried that, for example, when someone is buying a TAP card at a Metro station machine, they’ll be one more screen where it says – do you want to link you credit card to your TAP card? Perhaps that will never happen… but that’s what I had in mind. As it is, the way the transit benefits work already doesn’t “help” people like myself that are constantly switching between different agencies and don’t drive, so I use transit for personal trips as well (and therefore I would need an EZ pass if I’m getting a pass) and getting off the bus early to go do an errand on the way home, etc. It’s kinda hilarious (or not) when coworkers think I’d be one of the main people at my company using the transit benefits and in reality, they would require me to maintain multiple passes, thereby making them more of a pain than it’s really worth. I also asked about just using the cash balance to pay per a ride and was told I would need to submit a receipt from each ride. I’ve never heard of someone getting a receipt on a bus. TAP cards expiring isn’t much of an issue IMO. Every debit and credit card also has an expiration date so I don’t see why a TAP card can’t have one also. Credit and Debit cards don’t have stored value on them, they’re just a conduit for accessing separate stored value. E.g., you lose a debit card and you just get a new one, it still goes to the same bank account. You lose a tap card and you’re out the money on it. Selfishly, I love my CicLAvia tap card and never want it to expire. I think that tight fare integration is 100% the best thing that could possibly happen for bike share. Now, a non-TAP day, week, year, whatever membership should be an option. I’ve experienced plenty of bike share systems and it’s incredibly easy to purchase a one-day membership at the kiosk and check out a bike immediately. That should still be the case here. But if Metro can be successful in implementing both TAP technology and Metro fare integration, it will be a serious game-changer. Bike share is, and should certainly be thought of, as part of a larger transportation system. Being able to start a ride on a bus, then grab a bike, then finish on a train, all with the same fare would be both amazing and hopefully a seamless experience. THIS is how bikes will solve the first-mile/last-mile problem, not if they are a separate system with a separate fare or membership. From Metro’s reports, it seems like there are still kinks to work out if one wants to start a trip on a bike and then transfer to bus or rail… I really hope they are able to work them out, because that is the “first mile” side of it. If you’re going to integrate the fares for rail and bus the way Metro has, you’re right to seek integration of bike share the same way. They should be charging for trips, not rides/boardings, and when the fares are fully integrated with transfers, then a trip is what the rider pays for, whatever mode or combination of modes that trip takes. Also, best way to link a TAP card with a credit card for liability would be to require it on the bike share side, not the TVM side. If possible, it should be as simple as the bike share kiosk recognizing the first time a specific TAP card is used and requiring the user to swipe a credit card that time only. Once done, the bike share system has a credit card on file for liability and/or time overage charges, and a linked TAP card for ID and fare/transfer purposes. If you buy a TAP card at a TVM and never use bike share, you won’t have to worry about any extr screens, longer lines, more confusion, or anything like that. If you do use bike share with a TAP card, you don’t have to pre-register or use a website (we all know how well the TAP website works!) or do anything ahead of time. Just take your TAP card to a bike share station, swipe a credit card to link them up in the system, and off you go. It will take no longer than a first time, at-kiosk, bike share membership purchase would. Of course, the trick will always be implementing the technology so it works this seamlessly… One can hope. The TAP card that I bought last month doesn’t expire until 2025, which is much better than when TAP first rolled out. The website is also looking a lot better than it used to, with a lot more options for loading fare balance. TAP cards used to expire after 2-3 years… When I wrote this article, I wasn’t aware that they now last a lot longer – I am happy to hear it. Not necessarily. You can go to taptogo.net, register your TAP card, do balance protection and have your funds transferred over to a new card if you lose it. This is exactly, exactly how it should function. This is the Apple method of design: don’t present an option until you need it. Ostensibly linking your tap card to your credit card would be a one-time deal, and there’s no reason for it to be used for anything else in the transit system. So offering it only at bike share stations and online is a way to keep the process simple and straightforward. If you really felt it had to be included at transit TAP stations it would be best included as an alternate option to adding fare. First of all, different pricing schemes should be used to target each of the target markets for bike share. Higher daily rates should be available for casual users and tourists, and lower annual fees should be available for frequent users. I’ll concentrate on the frequent users. On Page 35 they have an interesting summary of the pros and cons of the pricing structures most commonly used in the US (e.g. annual membership fee of $60-$90, unlimited free rides for the first 30 minutes). The problems that they mention for this pricing structure are: 1) that it limits the revenue from the most frequent users of the system; and 2) it leads to the highest usage during the rush hours which often results in “dock-blocking”. I would be interested in a pricing structure that has a lower initial cost (say $30-$50 annual membership) but charges a small fee for each transaction (say 25 cents per trip, or 5 cents per minute) that could be deducted from your TAP card. This pricing scheme would encourage membership (lower initial cost) and would maintain a revenue stream from this important market. The monthly costs could be capped (say $15 per month) for the very frequent users (30 minute trip max still in effect). This pricing structure would have the added benefit of reducing the impact of riders who cheat the system by sharing a TAP card (don’t pretend that doesn’t happen). Someone who makes four rides per week would end up paying the same with this pricing structure as they would with the higher initial fee and free rides for the first 30 minutes. I’m trying yet to find a system that works like this. The most similar thing I found is Madrid’s BiciMAD, in which you pay a yearly admission fee plus 0.50€ per trip up to 30 min. Also, I’d be glad to find a system that sells a ‘bag’ of a number of trips, or somehow caps the total number of trips you can take, then charges a per-trip small extra. This would be a nice way to ensure a recurring fee from not-so-regular users who may want to purchase access to the system as some kind of insurance for those rare one-way trips. Bike-share walk-up usage is up since Metro lowered prices, nonetheless the program faces an important decision point this September. Bike-share is open at the Port of L.A., with 120 bikes at 13 stations in San Pedro and Wilmington. The system should be useful for Port tourists, though may face challenges. This morning Pasadena's new bike-share system opened. The system includes 375 bikes at 34 docking stations.